Tropical Storm Mirinae unleashed severe flooding in parts of central Vietnam, killing 23 people, leaving two missing and stranding families on rooftops, disaster officials said Tuesday. Five more bodies have been recovered, bringing the death toll in the hardest-hit province of Phu Yen to 15 people after the storm hit Monday, drenching the region with heavy rains, said disaster official Dang Thi Lanh. "Many villages remain cut off by rising waters and we expect the death toll to rise," she said. Several villages in neighboring Binh Dinh province suffered the worst flooding in four decades after the Ha Thanh River surged over its banks, said disaster official Nguyen Van Hoa. Five people were killed by falling trees or washed away by floods in Binh Dinh and two others were missing, Hoa said. In Khanh Hoa province, south of Phu Yen, three people were killed, a disaster official there said refusing to give his name. The military sent two helicopters to drop instant noodles to people in isolated villages and to rescue people who were still trapped on rooftops a day after the storm, which lost force as it moved inland. "We have received many calls for help from people who are still stranded," Hoa said by telephone. Ho Quoc Dung, vice chairman of Binh Dinh provincial People's Committee, said some 400 soldiers were mobilized to use speed boats to reach areas cut off by flooding and have ferried out more than 1,000 villagers. Several thousand remain stranded, he said. Mirinae hit the Philippines with typhoon strength over the weekend, killing 20 people before losing strength as it moved across the South China Sea toward Vietnam. Both Vietnam and the Philippines were still recovering from Typhoon Ketsana, which brought the Philippine capital of Manila its worst flooding in 40 years when it struck in September. Ketsana killed 160 people in Vietnam. 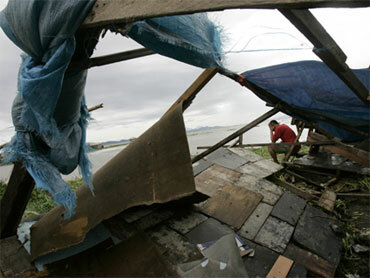 In the Philippines, Ketsana and two later storms killed more than 900. Some 87,000 people who fled the storms were still living in temporary shelters when Mirinae struck. In a separate incident in northern Vietnam on Monday, one woman drowned and five others were still missing after a whirlwind toppled two boats in the northern province of Quang Ninh, disaster official Le Thanh Nam said. Sixteen other passengers managed to swim to safety after the boats sank, Nam said.